Celebrating four years of friendship at our favorite place, The Sandbar. Blogging about the year end makes me feel like a little piece of me has withered away. In a sense it has — I (could be) one year closer to dying. (Or I could die in five minutes.) Regardless, I’m one of those people who hangs on to bits of the past. If you took a peek at my closet, you’d find my favorite Barbie doll from when I was three, an accordion folder of treasured schoolwork, and old issues of Sports Illustrated I can’t seem to throw away. It’s funny, though, because I don’t look back at 2015 with much endearment. I relate it to this: I fantasized that when I graduated from college, I would have all the answers. I’d have the dream job, the dream life that I’d long imagined as a child. I’m sitting in a coffee shop (writing this) six months later, and I have none of these things. 2015 got me on that one. I didn’t know what 2015 had in store — the possibilities were wide open. That’s the rest of adulthood. Pledge class 2011 in initiation order for the pub crawl. Life threw me quite a few curve balls. The first: I failed a journalism class, which left me three credits short of receiving my degree from the University of Kansas. The second: I quit my full-time job as a campus missionary to take care of myself, which leads me to…. The third: I was “diagnosed” with depression and general anxiety — I started seeing a therapist (major humility for me). The fourth: I spent two months in unemployment limbo. Through all of these things, I’ve learned the art of vulnerability and humility. It’s important to share experiences that you’ve learned from so that others don’t feel alone. If 2015 taught me anything, it’s that. I’ve spent hours, days, weeks, thinking, “I must be the only miserable person on the planet.” (Really, what percent of 23-year-olds are working at their dream job?) It’s hard to exit the black hole in your mind. So, here’s my suggestion for 2016: share life with one another. Worry less about closing yourself off from people who might hurt you. (Be less of a robot.) Pain is part of life. (Trust me, I’ve experienced plenty of this.) Listen to your gut. (*Shia LaBeouf voice* just do it.) If you feel that tug to share an experience, advice, a hug, a hand… Do it. The world needs extraordinary humans to spread love. It’s too late to say sorry, 2015, but we’re gonna have an adventure of a lifetime, 2016. When I discovered my love for journalism in high school, I immediately desired to work for ESPN one day. In fact, I thought Erin Andrews was a goddess who knew everything there was to know about sports, and I wanted to be her. I racked my brain trying to understand how it was possible that she could look so beautiful and still have all of this sports knowledge. Now I laugh at myself for giving her so much credit. Of course, Erin Andrews isn’t all bad but sideline reporters only do so much. The kind of career that I desired shifted throughout college. As I gained more knowledge about journalism, I realized that it’s not a job about glitz and glamour. Journalists get their hands dirty — even in the sports world. Journalists investigate, report, and seek the truth. This is the type of journalist I want to be. A journalist that searches for the answers and demands the truth. I’m very excited to with [HBO], they’ve been great. [They’re] a place that cares about creative people and freedom of speech — I’m very excited about that. Two of my favorite things: creative freedom and freedom of speech! Simmons attacks ESPN with this statement, and later admits in his third podcast (with Wesley Morris, a former Grantland writer) that he’s still bitter about his suspension. But the quote above sparked my intrigue: I’d always put ESPN on a pedestal, but does ESPN deserve to be on a pedestal? In the third episode of Simmons’ podcast, he and Wesley Morris talk about Simmons’ suspension and the future of Grantland. In the first 10 minutes, Simmons argues that ESPN failed to promote Grantland in the way that the network has promoted other projects. I never really stopped to think about this. It’s true, though. It enraged me. In between bites of my salad last night at dinner, I spoke to my mom about how foolish I was to believe that a company like ESPN believed in real journalism. She listened while I talked her ear off, confessing that I want to be a female version of Bill Simmons and that I hope to make a change in the world of sports journalism. I understand it’s bleak in the world of sports writing. But, wow, after today I couldn’t help but weep for future writers, like myself. ESPN made a monumental mistake by shutting down Grantland. How ironic that this news dropped one day after I started to make some important realizations about the monolith. Now, I’m left to wonder where the future of longform journalism rests. Will ESPN start a trend? Is this just a part of the culture — a culture that wants information instantly? I’m a part of “Team Simmons” when I say I’m an advocate for well-written, longform journalism. What Grantland offered was unique. I sifted through stories that interested me (on my Twitter feed) and developed connections with the writers I enjoyed reading. The thing that pains me the most is that ESPN continues to keep programs like “First Take” running, but authentic journalism is thrown to the wayside. And where is the integrity? Some of these writers found out through Twitter that they’d been laid off. Disgusting. It’s hard for me to wrap my head around the fact that TV personalities are more important to a so-called sports journalism network. But, wait, I forgot that (extreme) bias is more valued than objectivity. Tonight, I’ll be watching the World Series enjoying a glass of wine, or six, in honor of those who deserve a job more than Joe Buck or Skip Bayless. The world is a cruel one. I just hope that journalism is going somewhere. Yesterday started out like any other day for me. “Stockholm Syndrome” by One Direction blared through my phone, a reminder that it was time to start the day. I silenced the alarm and opened Twitter. The next few moments were not like any other day. 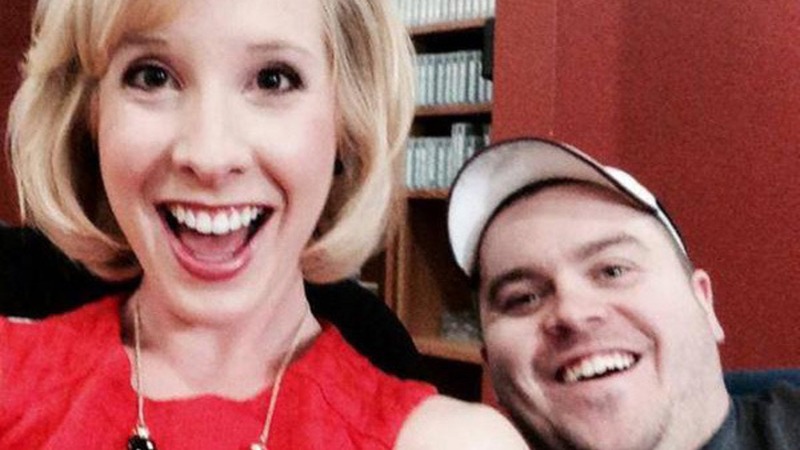 Alison Parker and Adam Ward thought it was any other day, too. They woke up before the sun, I’m sure, and followed their next assignment. A feature story on a resort in Moneta, Va. Nothing scary there. It was just a normal day, a normal story. Moments later, Parker and Ward were attacked. Thanks to auto-play, I saw this horrific event unfold before my eyes. I heard the shots ring out — seemingly coming from nowhere. I saw the panicked look on Parker’s face. I heard her shrill, distressed screams. And then, black. I will never be able to erase this scene from my mind. I placed myself in the shoes of the anchor back at the studio. How could I pretend like my heart didn’t just jump out of my chest? How could I mutter any words? How could I restrain tears from sliding down my cheek? How could I continue on with my work day? All of these things happened to me as an observer — an observer who doesn’t know these reporters personally. Yet, it seemed all too real…too applicable to my life. As a journalist, I could’ve easily been in that situation. I’ve covered so many different stories that I’m almost naive to any danger around me. I’m used to being out of my comfort zone. I’m choosing to avoid reporting from war-torn countries, or something of the like. But that doesn’t mean that I’m “safe.” Life is funny that way. And life is cruel. Anytime a shooting happens, we hear the same things over again. “Tell someone you love them today.” “Hug your loved ones a little tighter.” “Life is short.” “We need to do something about this.” And after every shooting, or tragic event, these things are repeated. But, do we really take these words to heart? Do we really live each day like our last? Are we still holding on to some grudge — a grudge with someone from 10 years ago? Do we tell the ones we love that we love them? Appreciate them? It shouldn’t take a tragedy to take these things to heart. It shouldn’t take a tragedy to put forth our best self. It shouldn’t take a tragedy to live life fully. My heart is heavy for the ones who love Parker and Ward dearly. Based on the things that I’ve read about the journalists, the pair is adored by not only their family and friends but also the community. To Roanoke (and surrounding areas), this is the time to support each other. To remember that human lives are special. To remember to lean on one another. To lift up one another. These are the times that I tend to look toward our Heavenly Father for comfort. Take your pain to Him. Let Him love Alison and Adam; let Him guide His beloved children home. Rest in peace, Alison and Adam. You are loved and missed. Prayers to Vicki Gardner for her continued recovery. My last paycheck came in the mail today. I knew my days as an intern at the Grand Junction Daily Sentinel were over when I said my goodbyes over a week ago… Now, I feel there’s closure on my chapter as a summer intern. I walked out the heavy, blue door with thoughts swirling around in my head. Did I leave the building for the last time? Did I make lasting impressions during my two months in Junction? I could only answer “yes” to both because I continue to aspire for more. My supervisor left me with kind words, and promised me a Letter of Recommendation. (She even offered to have me come back as an intern next summer. This happened in a later email exchange). My first story, when I attended an Emergency Medical Services Week BBQ, taught me to turn stories quickly and efficiently. My first story being published was just an incentive and a confidence-booster. My last story helped local petitioners get the word out. The petitioners, who were skaters from around the area, started a petition for new (or to revamp current) skateparks in Grand Junction. I spent more time on my last story. I didn’t have writer’s block; I was sad that my internship was ending. When I finally turned the story in, my supervisor was pleased with my final article. I cannot thank my supervisor enough for giving me the opportunity to intern in Grand Junction. I grew as a person because I forced myself into a new environment. I learned to create conversation with strangers. I learned to maneuver a new city (even though Junction is actually pretty easy to navigate). I learned to check the spelling of every name. Three times. And check it again. I learned to research before interviewing my subjects. I learned to work in a newsroom environment, which is quite fun, actually. There’s always food…. I loved my time at the Daily Sentinel. I feel better prepared as a journalism student. I will continue to apply things I learned in the newsroom to my school-life. I will keep improving my writing and editing skills. Writing is my passion. This is the most important thing I have learned. Blink. Two weeks have gone by. The holiday weekend ruined my journalistic efforts. My boss was out of the office — unplugged — for two weeks. One could say I was a bit helpless. First, there were no fireworks stands in Grand Junction. I blame that on the fire ban. I took my vacation early. When I came back to the office, news had extended its vacation. I blame that on Grand Junction. I developed a few stories, and kept some for desperate days. That week, I became distracted by a visitor — my boyfriend — that came to venture Junction. Somehow, I was able to work through distraction. I met a stellar lady, who started a wonderful organization. 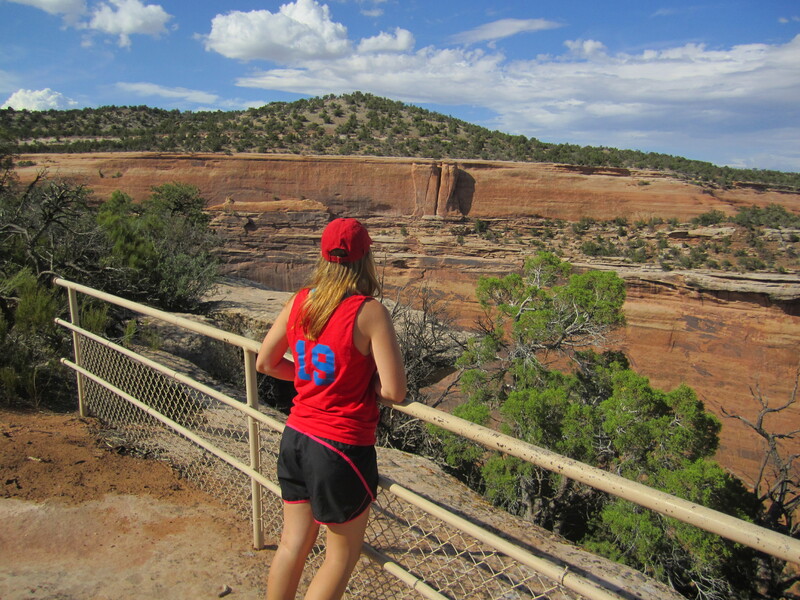 I enjoyed driving the Colorado National Monument with my boyfriend. Here I am at Fallen Rock Overlook. Colorado treated me to wonderful views. And here, I am in my final week of my internship. Blink. Two months have gone by.